The Mini Clock Cam is one of our bestselling products and it just got a brand new revision with travel in mind. This new model is just what you need if you're looking for a covert nanny cam that's designed with the on the go person in mind. This portable travel clock has been specially designed for the traveling individual. Whether you are traveling for business or pleasure, you take a risk when you stay at a hotel. Housekeeping and maintenance comes and goes all day long while you are out of the room, leaving your cash, jewelry, iPod or other personal belongings alone. The Mini Clock Travel Portable is the covert device for you! This model is lightweight and about the size of a Smartphone, making it perfect for pocket or suitcase travel. It can sit on the hotel nightstand and never raise suspicion. You can record 12 hours of 1280*960 resolution video using either the continuous video recording mode or the motion detection mode, which is specially designed to preserve battery life. The camera is even capable of a 72 degrees viewing range so it can follow the movements of anyone who walks through the room. When it comes to storing all this vital footage, the mini clock travel portable supports MicroSD card storage ranging from 2GB - 32GB. Not only is this a covert camera, but it is also a functional clock with a display that cycles through time, date, temperature, and can even be set for an alarm. So next time the housekeeper comes to clean when you aren�t home, keep an eye on their activity. 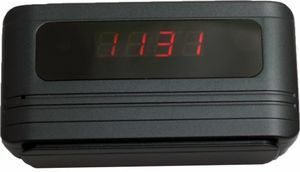 This standard alarm clock records 1280 x 960 color video and audio and includes motion detection. An included Li-Ion battery lasts for up to 12 hours on one charge, and its new sleek look fits in just about anywhere. The display cycles through time, date, and temperature. Included Li-Ion battery lasts up to 12 hours on one charge! Disclaimer: Cameras with audio function laws vary by locale. Please Review the Laws in your Area Regarding Legality.